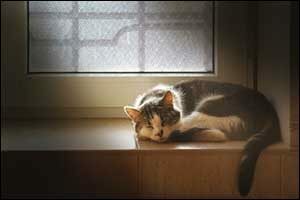 There are a few main reasons why people will have outdoor cats. Either it’s how they have always done it, like their parents and grandparents before them, or because they feel that cats need to live in a “natural” outdoor environment to be truly happy. However, most domesticated cats are not well-suited for outdoor life in this day and age. In fact, many are simply unable to handle all of the dangers and risks that are out there in the typical suburban neighborhood, let alone the big city. If you want to give your cat access to the great outdoors, the best way to do it is by creating a safe environment that will allow them the outdoor “experience” without actually leaving your care. Your local veterinary clinic in Dartmouth could probably give you a list of reasons why your cat should not be let outdoors on its own. Westport pet owners need to be aware of the common dangers associated with having an outdoor cat, some of which could impact the health and safety of the people in your family, as well as other pets. Cat scratch fever is a real thing, along with many other diseases, viruses, and parasites that can cut your pet’s life short. Vaccinations for cats are necessary, but not all of the cats they will come in contact will have had the same type of care, so there are still other problems that can occur. PARASITES – While most people think about fleas and ticks first, there are other pests to worry about in New England as well. Ear mites, intestinal worms, and ringworm, which is a fungal infection. All of these parasites are dangerous on their own, especially in young juveniles and senior cats, but they are also dangerous to people because of the diseases that they can carry and bring into the home environment. RABIES – Rabies has been reported in every single state, except for Hawaii, with the top five animals affected including raccoons, foxes, skunks, bats, and cats. Rabies is a death sentence for most cats. If your cat is attacked and bit by a wild animal and the cat is not up-to-date on rabies vaccines, the local authorities could require quarantine for as long as six months. If your cat were to bite a human during that time, the local health department would often require rabies testing and euthanasia. OTHER DISEASES – Your cat is more likely to come in contact with another cat that has a serious disease if it spends time roaming outdoors. Feline leukemia (FeLV), feline interstitial peritonitis (FIP), feline immunodeficiency virus (FIV), calicivirus (respiratory disease), feline viral rhinotracheitis (herpes), and feline distemper are by far the most common, contagious, and deadly diseases that can affect outdoor cats. PREDATORS – Cats are easy prey for coyotes and other predatory animals, including hawks, eagles, owls, and foxes. Depending on where you live, there may be other dangerous predators lying in wait. Speak with your local veterinary clinic in Dartmouth for information on local attacks and things to watch out for in your area. Even other cats can be dangerous in a fight or another type of attack, causing puncture wounds, which can abscess and cause serious harm. Westport pet owners need to know that it’s not just about protecting a pet with vaccinations for cats or by having an understanding of common diseases, such as cat scratch fever, but also in keeping your cat safe from common city dangers. Cars and trucks, mean-spirited teenagers, falls from roofs, trees, and balconies, wild animal traps, and pest control products meant for rodents, are just a few of the dangers lurking in the average neighborhood. Some cats do not have a good sense of direction and can become lost. Without the hunting skills required to live out on their own, many do not survive. If you still have questions about indoor/outdoor cats, visit your local veterinary clinic in Dartmouth and speak with one of our staff. Anchor Animal Hospital has been providing top quality services to Westport pet owners and their pets for many years. We can provide regular check-ups, emergency services, dental cleanings, and vaccinations for cats, as well as treatment of diseases, preventive services, and much more. Give us a call at 508-996-3731 and schedule an appointment with one of our friendly and experienced veterinarians.